Sri Lanka achieved yet another milestone on the region’s broadband technology landscape this week, as Dialog Axiata announced the launch of its commercial 4.5G TDD LTE network. 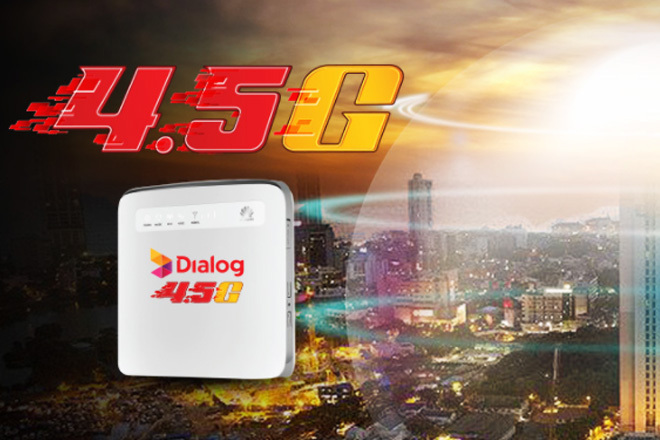 The roll-out of South Asia’s first commercial 4.5G TDD LTE network with Dialog’s Home Broadband services will be initially available in selected zones in the city of Colombo, and will be expanded to the rest of the country as part of Dialog’s drive to deliver Sri Lanka’s fastest 4G Network. The Commercial launch of 4.5G sets a solid foundation for the future evolution of the nation’s Broadband services to a technology generation well ahead of neighboring markets. “The deployment of commercial 4.5G broadband services serves as a springboard for the rapid accession towards 5G services, and demonstrates Dialog’s readiness to deliver the most advanced suite of connectivity services to consumers. We are privileged to empower and enrich the lives of millions leading the technology transformation both here and in the region and this rollout will bring us even closer to the connected future we envisage for all Sri Lankans,” avers Supun Weerasinghe, Group Chief Executive of Dialog Axiata. The launch follows Dialog’s demonstration of its capability to deliver throughputs in excess of 1 Gbps on the LTE Radio (Air) Interface in June last year – another regional first. The launch of commercial 4.5G services will compliment Dialog’s 4G LTE broadband services to enhance the provision of next generation digital services to homes and offices. The Company is privileged to lead Sri Lanka’s mobile industry towards the 5G era with the launch of 4.5G, as Dialog continues to invest aggressively in a world-class portfolio of services ensuring Sri Lankan consumers enjoy the region’s most advanced suite of connectivity selections.